It is an exceedingly rare occasion when one can use the word “legendary” to refer to a person and not be overstating the case. However, when it comes to the former executive editor of the Washington Post Ben Bradlee, it is arguably the only word that can be used. Bradlee passed away at the age of 93 on October 21 to the collective devastation of the journalism world. It’s always sad to lose someone who has given so much to the free press and the public, but sorrow over Bradlee’s graceful exit of natural causes is lessened slightly by his long list of public contributions made during his long life. As executive editor of the Post in the early 1970s, Bradlee oversaw Carl Bernstein and Bob Woodward’s coverage of the Watergate scandal, which led to the resignation of President Richard Nixon. He also famously pushed the government for the right to publish stories based on the Pentagon Papers, a secret history of deliberations about the Vietnam War. In late 2013, President Barack Obama gave Bradlee the highest civilian award in the United States, the Presidential Medal of Freedom. In a Washington Post story by Robert G. Kaiser, Bradlee’s 26-year tenure at the Post is described as a transformative period. “From the moment he took over The Post newsroom in 1965, Mr. Bradlee sought to create an important newspaper that would go far beyond the traditional model of a metropolitan daily,” wrote Kaiser on October 21. His inspirational influence helped both the paper’s circulation and newsroom staff double. He opened new bureaus, sent correspondents to far-flung corners of the world, and led the staff to win 17 Pulitzer Prizes. He was also known as an extremely dapper, sophisticated gentleman who always dressed in style. The consummate journalist, Bradlee’s influence extended far beyond the Post and his work there. 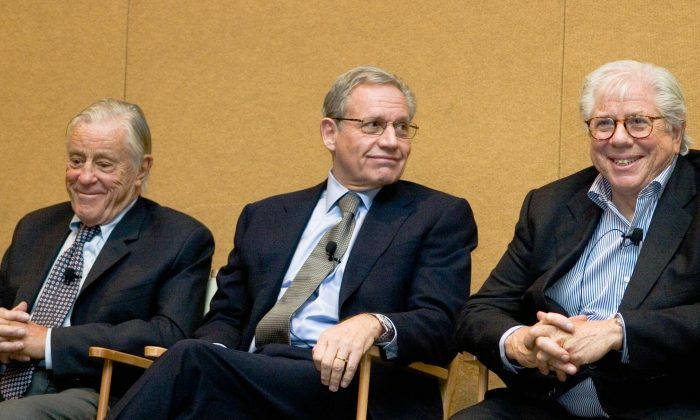 In 2007, he joined his former reporters Woodward and Bernstein on stage for a national conference put on by the Society of Professional Journalists in Washington, D.C. I was in the second row of the jam-packed auditorium, waiting for the program to start, when the guy next to me struck up a conversation. “Have you ever seen ‘All the President’s Men’?” he asked. I’d never even heard of the movie based on the book by Woodward and Bernstein about their time covering the Watergate scandal. New to journalism, attending my first conference, I had very little background knowledge about the men who were about to speak. But by the time they were done relating tales from the battlefield and reminiscing about covering Watergate, I was hooked. “If this is what journalism can be, I’m in,” I thought to myself, deciding then and there to be a full-time professional reporter. The memory of seeing those three men on stage has stuck with me even as I’ve dreamed of someday having an uncompromising editor like Bradlee. It has served as a benchmark of kinds—not only for journalism’s legacy, but for its future. The lessons from that brief moment center on the tools of tenacity, bravery, and honesty that a good reporter must employ in his arsenal of weapons, as a vanguard of the free press. It is imprinted on me just as firmly as if it’s been in my DNA all along. Perhaps that’s part of what made Ben Bradlee so special: his ability to inspire the best in journalists, even those like me whom he just brushed past.